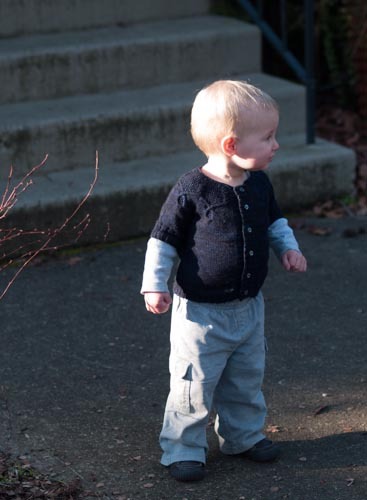 Back in the spring I started a short-sleeved Pomander for my boy in the 18-month size. He passed that milestone on the solstice and lo, it fits him perfectly. (How much am I going to miss that cute round tum in a few years when he’s all limbs and muscle?) 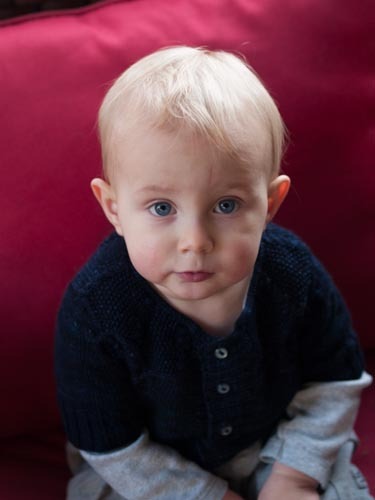 As I predicted, the yarn—Knitted Wit Cashy Wool, seriously luscious—is almost impossible to photograph, but I couldn’t resist this deepest blue for my fair fellow and I find I quite like the subdued look of the yoke on my little man. 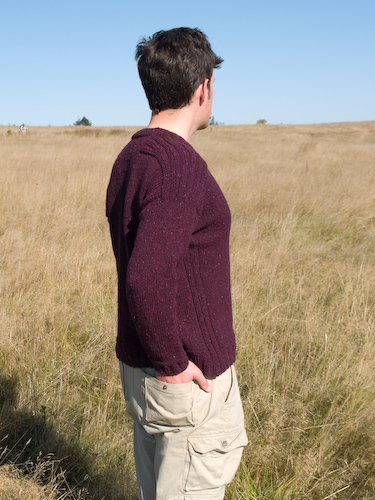 I used every last inch of this 400-yard skein, even calculating my yardage per round on the sleeves so I could measure out exactly how much to allot to each one; the resulting elbow length is just perfect for wearing over another shirt and handily keeps him from wiping his mouth on the handknits, too. 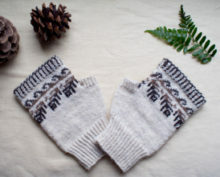 The ability to make this a one-skein pattern in any size was one of my chief reasons for constructing the sleeves as I did, with a provisional cast-on to complete the yoke before picking up and knitting the sleeves downward. And I’m happy to report it worked. Busy Jolly. He can sing. He can tiptoe. He whistles when he blows on his hot oatmeal. He can stick the landing on a few ending consonants so his words no longer have sixteen possible meanings. He understands everything. He can say no no no and run away cackling when it’s time to pick up toys or go to bed. He managed a sentence: “Baby…eat…roro!” (Roro are frozen blueberries.) He can flop and wail theatrically when he doesn’t get what he wants. He can make a joke by declaring that peas are yellow or brown. He gives the world’s sweetest kisses and will take it upon himself to go find something that will comfort his sister when she’s hurt. And oh, how he’s growing. 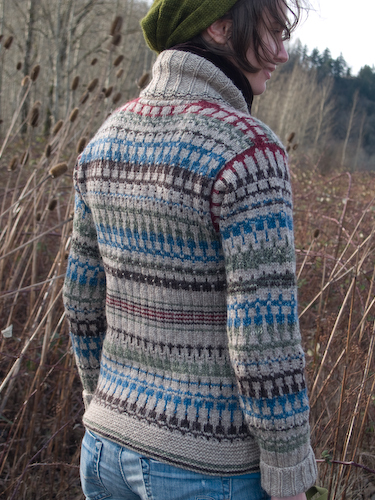 I’d better get cracking on a new round of sweaters for 2014. 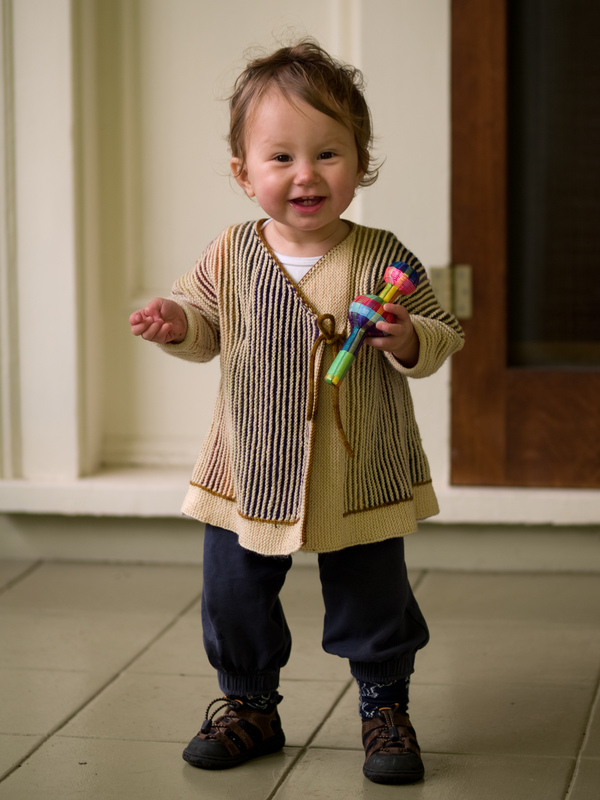 The next kids’ design in the WGK hopper is a unisex cardigan, so I’m thinking there will be one apiece for the littles. But first I’ve got a side project to tackle — the reissue of a sock design called Andamento that’s reverted to me. 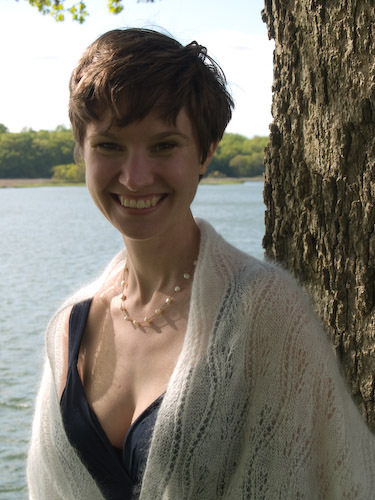 I confess it wasn’t on my radar at all, but a Raveler went hunting for the pattern and couldn’t get it from the original publisher, so she contacted me about it last week. I find the design still pleases me after five years, so it’s no burden to visit the local shop for a skein of Malabrigo Sock and cast on a new sample. Okay, I made two visits. The first day I grabbed a skein of Marte, one of my favorite Malabrigo colors, but when I got a few inches in I had to admit to myself that it probably wasn’t bright enough to photograph well. So I went back for a skein of Turner. It’s looking promising, and I’m glad to be sending this design back into the world. Golly, I haven’t knit a sock in far too long. Let’s see if I have the stamina for four in a row. My mother was eyeing the Marte, and I noted a pair of socks I know I knit at the same time as the original Andamento sample — half a decade ago — carefully air drying inside out in her laundry and looking quite lovingly cared for… my duty is clear. 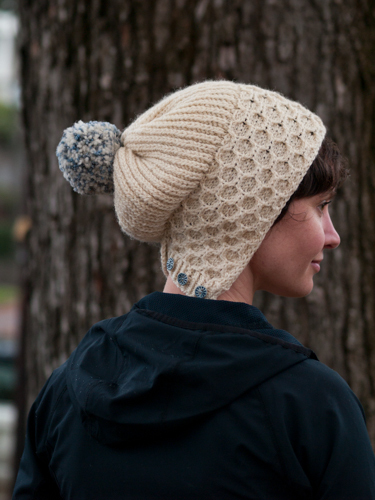 Tomorrow I get to tell you about an exciting project that isn’t made of yarn. It’s been under my hat for a month and I can’t wait to see what you think!